Konica Minolta’s CM-2600d spectrophotometer is designed to measure SCI and SCE numerical gloss control simultaneously. This light, handheld instrument is the first of its kind in the world that brings significantly lower measurement and calibration procedure time through its patented numerical UV control. This advanced unit includes a changeable aperture that can be set to between 8mm and 3mm, depending on the object of measurement’s size. A body design that is easy to carry, two measurement apertures that are interchangeable and an illuminated viewfinder make the CM-2600d spectrophotometer the tool of choice for a wide range of measuring tasks. It fits comfortably into your hand, thanks to its ergonomic design, allowing you to take measurements from a variety of angles and in less than two seconds get highly accurate measurement readings. Ease of use is assured with just two controllers – a wheel and a button. The button is used to take measurements, and the wheel functions similar to the way a computer mouse functions. With it, you can scroll through menu items on the Cm-2600D Spectrophotometer’s large screen and select the necessary operations you want the device to perform. Data is displayed either with numbers or graphics, so you can instantly see whatever information you need. On the CM-2600d Spectrophotometer, information that’s readily available includes colorimetric data with descriptive color difference, L*a*b* color graph with box or elliptical tolerances and pass/fail indications. A display reversing function makes it possible to read the screen in any direction, and the wording on the screen can be programmed for English French, Spanish, German, Japanese and Italian. 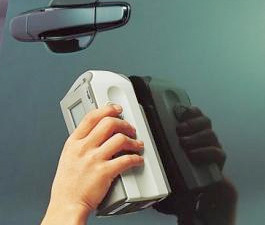 Measuring is quick and simple because of the unit’s illuminated viewer; true sample viewing is possible on light or dark objects with one touch. 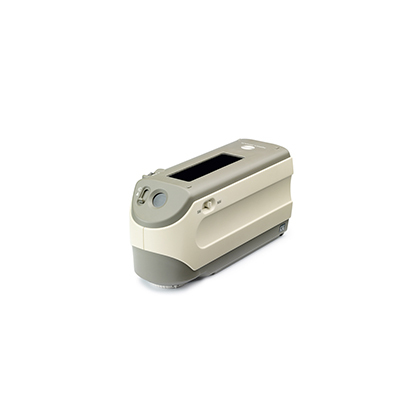 The CM-2600d spectrophotometer features Konica Minolta’s patented InnovativeOptical System. In any quality control application, it meets the most stringent color measurement standards. A d/8 sphere has built into it both numerical UV control and numerical gloss control, which simultaneously produces SCI (specular component included) and SCE (specular component excluded) data. The LCD display will show the results of both measurements any time you want. The device is rugged enough for any application, thanks to it containing no moving parts. This was the first unit of its kind on the market with our patented numerical UV control, which significantly lowers time spent on calibration and measurement tasks when working with a variety of materials like detergents, paper and textiles. Two xenon flashes – one that excludes UV, one that includes it – and special mathematics are included in this technology to allow readings from both flashes to be viewed on the screenof the CM-2600d Spectrophotometer. The CM-2600d Spectrophotometer works with SpectraMagic NX software that’s simple to read and use. The software shows the results of measurements in several views, and these results can be edited. You can associate data from the primary target to data from two or more secondary targets. This lets you perform high-level quality control applications like determining the difference in colors. Finally, you have the ability to use the same drag-and-drop function that you’re already familiar with on computers to put information into the software and then, following printing, easily interpret it. Users can display various data on numerous graphs. Instrument information can be viewed at a glance through a status window. Templates that have been preconfigured are also available. If you have older versions of software, such as an older version of Excel, with data you still need, it’s simple to export it to the software on the CM-2600d. The unit comes with a navigation function and color tutorial. ** There is another version of this spectrophotometer – the CM-2500d – that comes at a lower cost and is just as simple to use. That unit has just a single aperture (8mm) and does not have a UV adjustment function. LCD display – has multiple displays and features a display reversing function so screen can be read no matter which hand is holding the device. Easy to use – only has two main buttons, one to measure and another, “navigation wheel”, which scrolls through options and clicks down to select. Illumination / observation system d/8 (diffuse illumination, 8-degree viewing ), equipped with simultaneous measurement of SCI (specular component included)/SCE (specular component excluded) Conforms to CIE No.15,ISO 7724/1,ASTM E1164,DIN 5033 Teil7 and JIS Z8722 Condition C standard. Inter-Instrument Agreement withinΔE*ab 0.2 (MAV/SCI) Average for 12BCRA Series II color tiles compared to values measured with master body. Data memory 1700 pieces of data (as SCI/SCE 1 data) * 700 pieces of data in the “defined in COND.” mode.